Let nature take its course…with occasional bursts of hand weeding, re-staking plants that are bending. 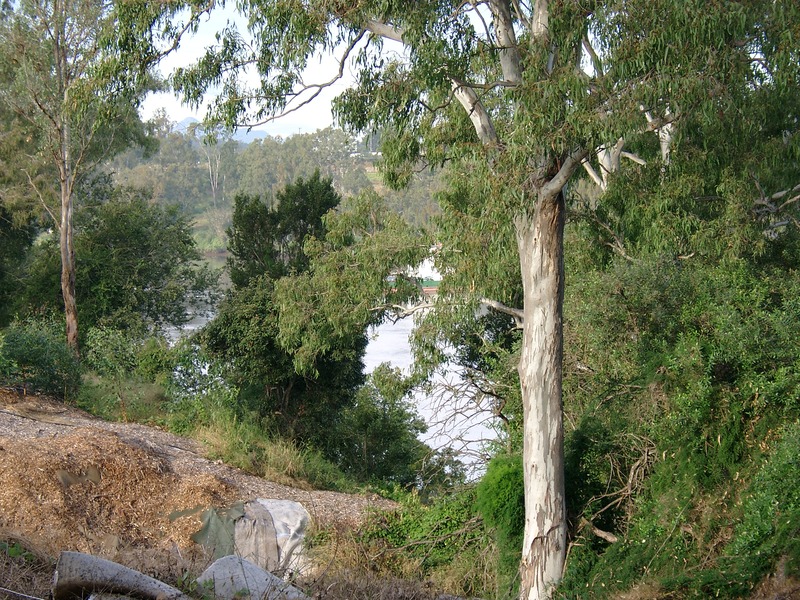 The land that sat alongside the Brisbane River had been allowed to turn into an impenetrable tangle of lantana, blackberry bushes, long grass, Chinese Elms, guavas and some native trees including eucalypts. 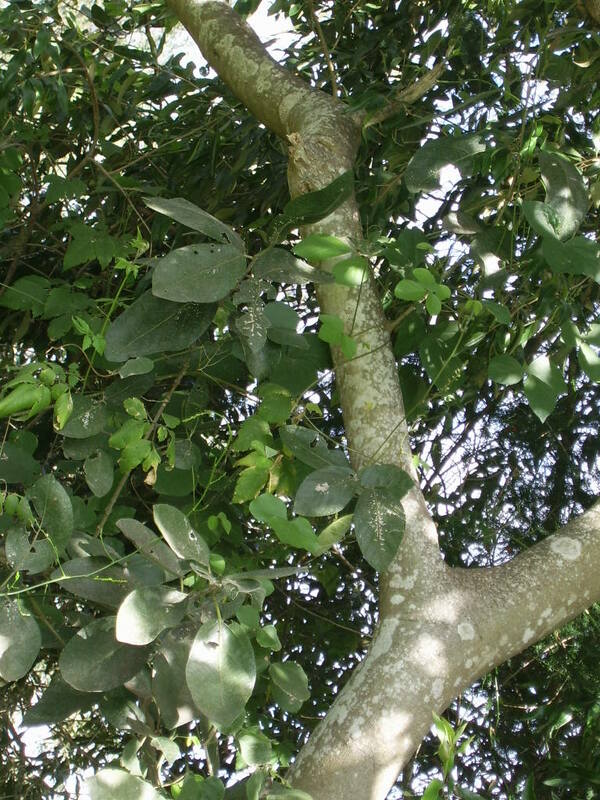 A veil of glycine, climbing asparagus fern and balloon vine trailed over the vegetation especially on plants and trees closest to the river. This wall of lantana was typical of the difficulty of gaining access to the river and gives an indication of the huge task of returning the riverbank to native habitat. 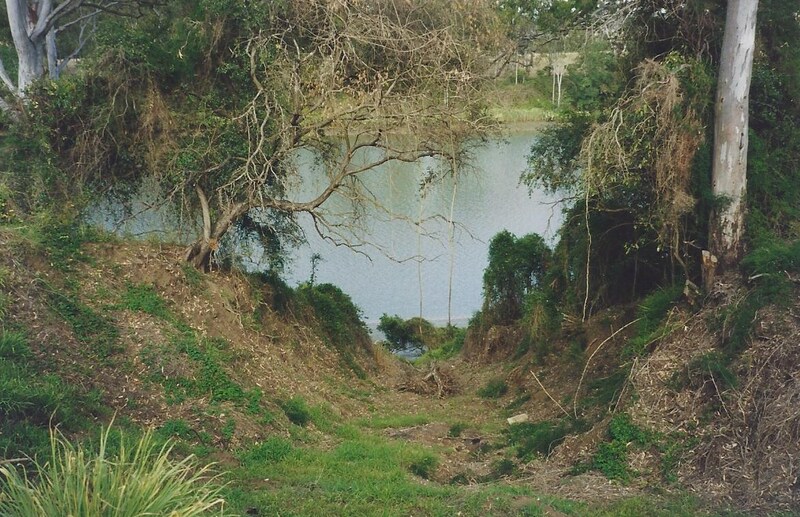 Eventually a path was cut through the gully to the river. 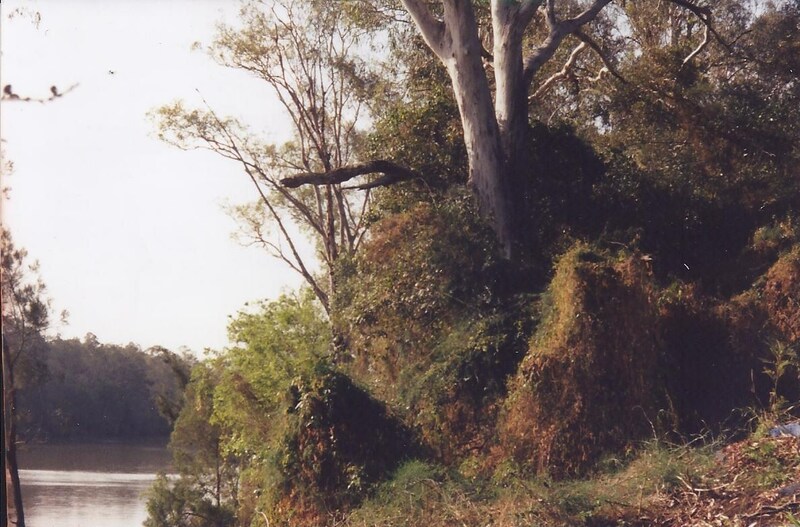 By the time a path was cut through the centre of the gully, one was still faced with another host of riparian weeds draped over the vegetation. 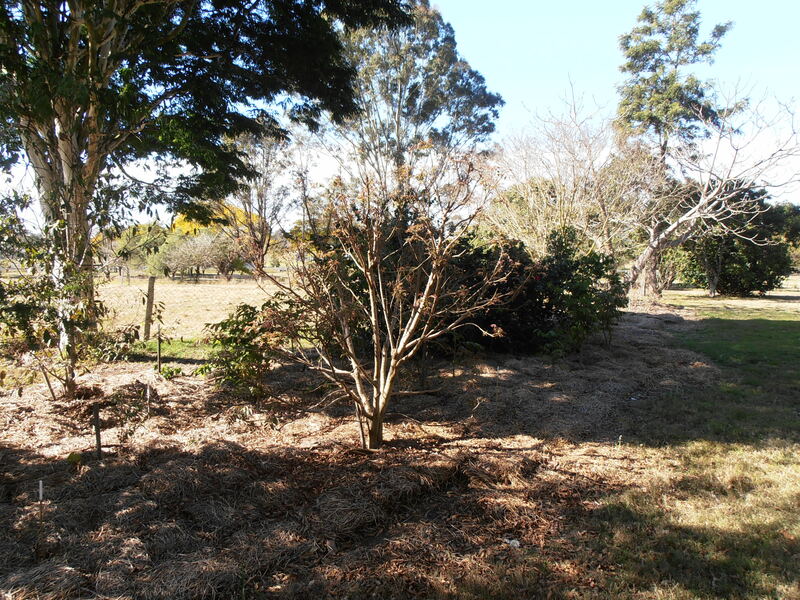 In the following photo – of an area adjoining the gully – most of the lantana and blackberry bushes have been removed so that the ground can next be covered with the rolls of carpet. 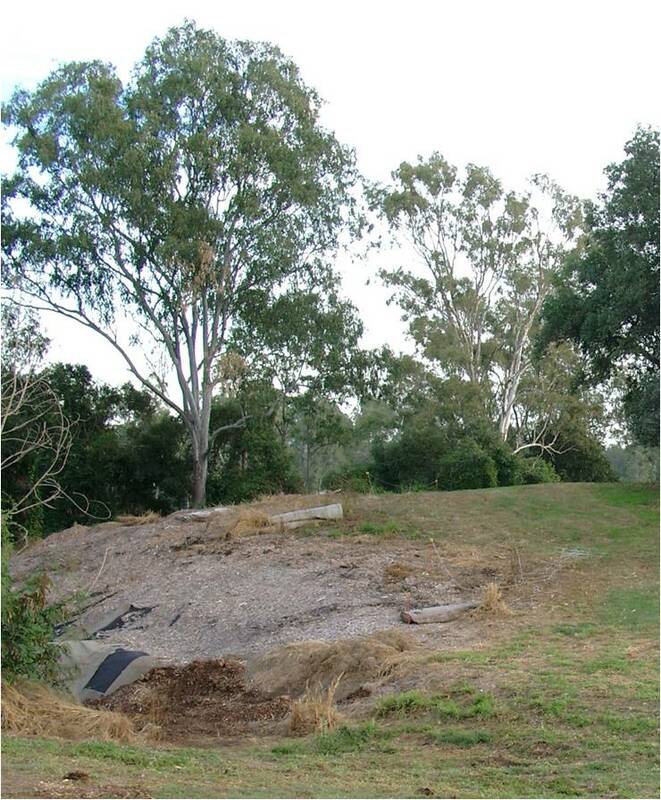 The deep part of the gully had actually been used as a place for dumping machinery and smaller items of rubbish such as glass bottles. It was quite dangerous in parts with sharp pieces of metal protruding or holes gaping but it was easier to drape the large implements and mechanical devices with carpet than to attempt to remove them. Besides the heavy work of dragging and spreading carpet, there followed afterwards the strenuous work of carting the mulch and shovelling it over the carpet. Andrew and Luke helped Ian accomplish this – all by hand. 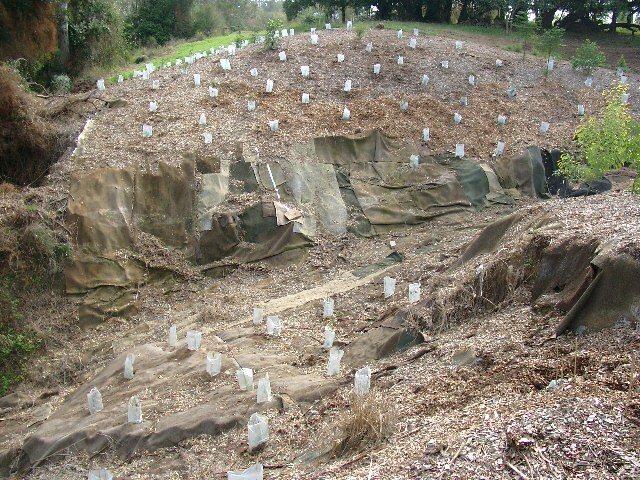 Then the carpet had to be cut in the form of crosses so that each native plant could be dug into the soil. 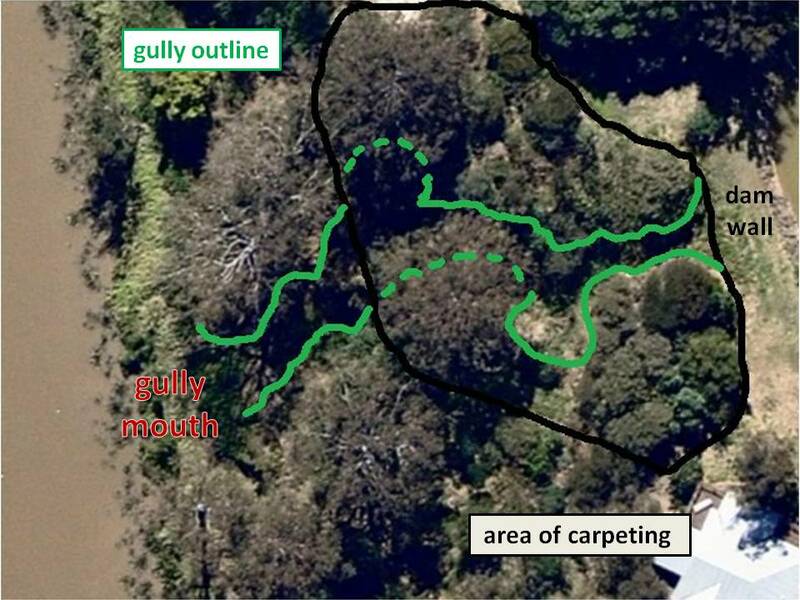 After a colossal effort over many months of 2005, Ian succeeded in carpeting the entire gully, mulching it and planting natives that are indigenous to this area. 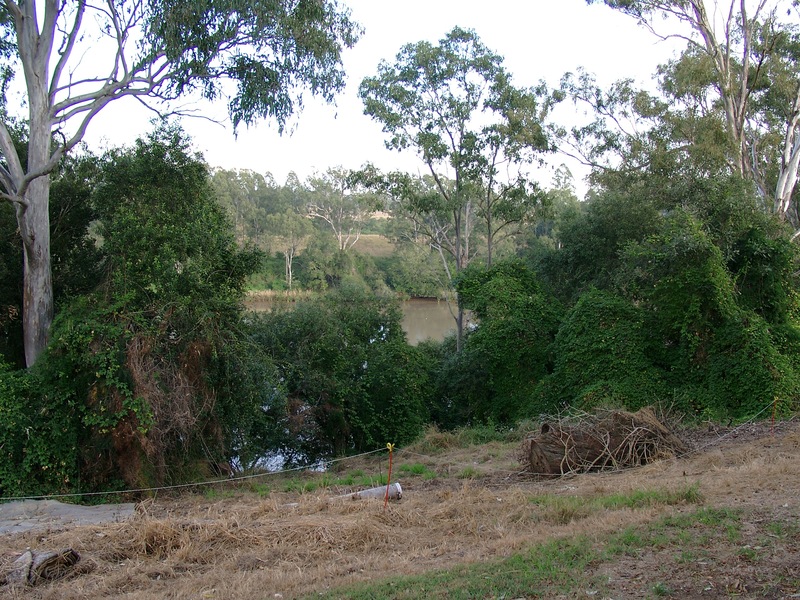 It is virtually impossible now to take a photo of the gully from the same angle as the view is completely obscured by tall trees, however the next aerial photo in September 2010 shows the area that was almost completely covered in carpet and staked plants. 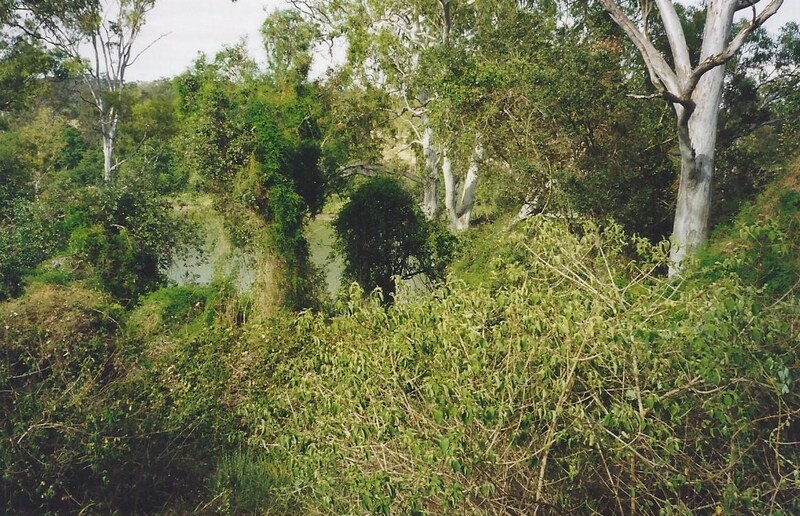 This restoration of bushland has created a natural sanctuary for native wildlife. Work in the coolest parts of the day and take your mobile phone (snake bite / take photos of wildlife) with you as well as snacks, bandaids etc. Plant when the season promises to be wet. Note Well: After the enormous rainfall of late 2010 leading into 2011 Ian purchased two truckloads of hay bales that had been spoiled by the rain and consequently were much cheaper. 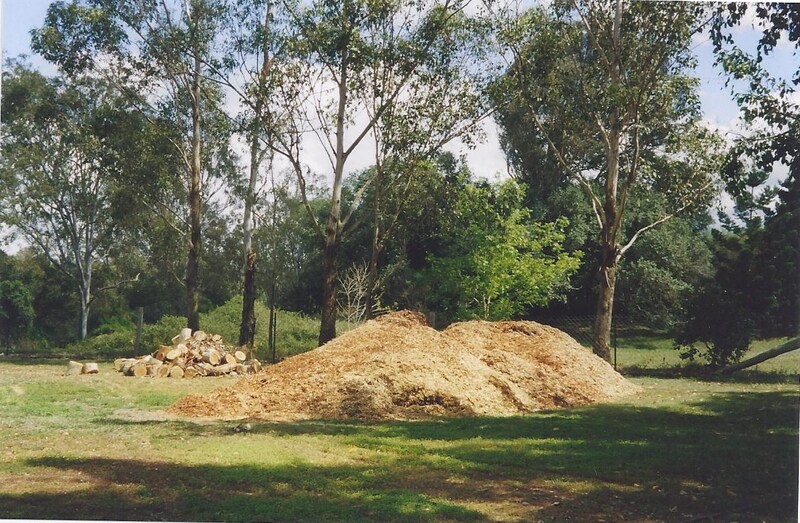 He used this as a fast way of providing mulch to other garden areas where old mulch had virtually broken down. He could cart a number of bales to a site then split them in half (pulling them apart into two or three layers) and then lay them thickly. This proved to be such an easier job than shovelling traditional mulch. 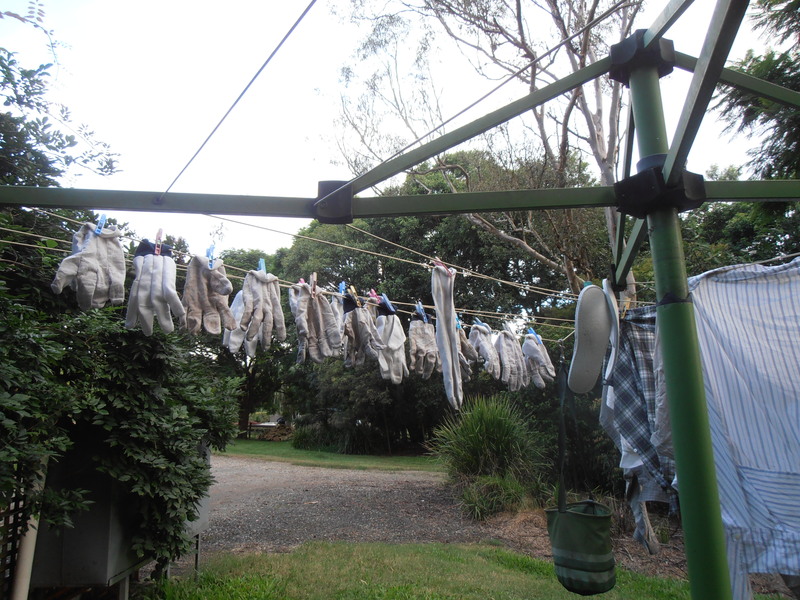 We now have dozens of lengths of pink plastic twine that tied the bales into groups!! 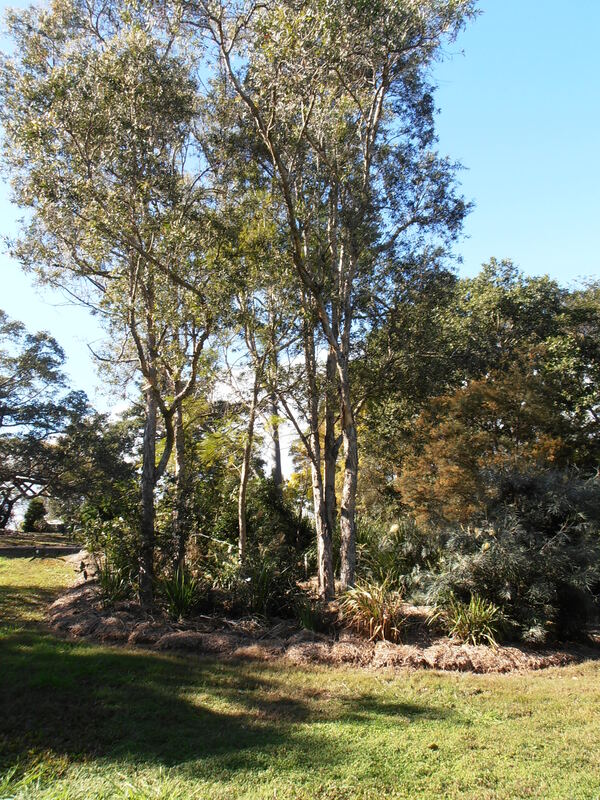 See Plants page on Menu for tips on how to acquire native plants more cheaply.